To help you find the Best Guitar Lessons, TopConsumerReviews.com provides you with an in-depth comparison of Jamplay and Elmore Music. Who has the best Guitar Lessons? You’ve been saying for a long time that you wanted to learn how to play the guitar. Set aside the air guitar and pick up a real one! Guitar lesson programs of all types and learning styles are available to help you achieve your string strumming goals. Do you like blues, rock, country, jazz, or classical? You’ll find there are guitar lessons that will teach you how to play any musical style on the guitar. If you’ve already been playing guitar for a while and need to improve your skills, there are a variety of programs to help you move to the next level. While many guitar lessons are geared toward novices, some companies offer guitar learning systems with a series of instructional levels that will help you move your musical career forward. JamPlay offers guitar lessons via HD video to beginner through experienced players, focusing on blues, rock, country, metal, and a variety of skills and songs. You can take up to 25 Master Classes with 504 lessons or 44 Live Courses with 699 lessons. In all, with a JamPlay membership, you’ll get over 400 courses with over 5,500 lessons via 80 different instructors. JamPlay’s Community feature hooks you up with thousands of other players of all different levels who can help you with moral support, questions, or ideas for learning. The live chat runs 24/7 and lets you connect in real time with members and JamPlay teachers. The Chord Library allows you to make custom chord sheets, so you can work on just the ones you struggle with in your practice routine. Also, there are over 950,000 chord voicings in 30 different tunings that you can sort in a variety of different ways. Chords are depicted as charts, tablatures, and photographs of fingers holding down strings over frets. JamPlay has gone to a lot of effort to create a comprehensive scale library. It diagrams on the fretboard where to play the notes of each scale and how they apply to theory, solos, and other aspects of playing the guitar. There is a large selection of demonstration and improvisation videos for each of the scale patterns in the library as well as an interactive tool for customizing the scale diagrams. JamPlay’s JamTracks section lets you access a library of professionally recorded jam tracks to play along with in genres ranging from Rock to Funk to Ambient. If games are a way for you to more easily learn how to do anything, then JamPlay’s membership includes a Games section. The games help you with fretboard memorization, notation quizzes, note identification, and pitch recognition. Some learners want to skip right to learning how to play “sweet licks” on their guitars. The JamPlay Lick & Riff library gives you tons of ideas on how to play both popular and original sequences in a variety of genres and styles. Custom progress reports let you monitor your progress for every lesson. If you only understand part of the lesson, you can mark the percentage you understand and come back to it later. Progressive bookmarking allows you to mark a spot in a lesson so that you can come back to it later and re-learn or practice it again. Note saving is for people who want to make a note of a technique or to-do within a lesson. Notes are stored in a database for future reference. Live structured guitar lessons via 1080p video feed let you interact with an instructor. Daily JamChat live Q&A sessions over 8 hour stretches each day also include regular open mic nights to jam with others or webcam-to-webcam. JamPlay’s pricing is not immediately apparent or easy to find. It was buried in the 2nd column of the FAQ page. They have a money-back guarantee of 30 days for a full refund. But the refund request must be made in the first 7 days of membership. On the Enroll page, the money-back guarantee and privacy pages along with several other informational links in the site footer lead to “404 not found” errors and nothing else on that page is linked that ought to be clickable to get to more information. JamPlay has a lot of neat features that can help people of all learning styles get something out of their program. We especially liked the chord and scales library and tools, plus the games for making lessons more fun. It would be better, though, if the pricing were a bit more up-front and the 30-day guarantee wasn’t restricted to being requested within the first 7 days. All Access pass is $12.95 per month or $97 per year. Elmore Music’s website has three main areas to appeal to guitar learners. The videos section contains 15 free individual videos on topics ranging from effective practice, picking, chord mastery, strumming, percussive guitar, and scales. The videos are each of relatively short lengths, at between 1 and 5 minutes each, as compared to the more comprehensive paid tutorial videos Elmore offers. Elmore Music has a downloads section of the website that offers a single report about 50 ways to improve playing. The page description doesn’t offer much more detail than that unless you provide your name and email address to instantly download the whole report. The main product of the website is its programs section where Elmore offers over 20 full-length lesson topic areas delivered as 20 or more videos per topic online and/or as a hard copy. The topics range from Beginner to Classical, Lead, Rock, and “2.0” versions of the same. Each topic set is individually priced and comes with a membership to the Ultimate Guitarist Members Center where you can post questions and get tutoring. You also get the latest copy of the digital magazine “Fret Talk” that contains text, images, and video that plays right in the digital magazine. If you purchase a program individually, the program videos can be accessed online only for $39.95 or you can get an instant download plus hard copy for $49.95. Elmore Music also offers an “All Access Pass” product to purchase all of their programs. There is a 7-day free trial for the all-access pass and then you pay $12.95/month or $97/year to get access to everything from that point forward. You can cancel at any time for any reason. And there’s a 60-day money-back guarantee. We found the website a pretty confusing in terms of getting all the detail we needed to decide whether to make a purchase. From the looks of the free videos, the tutorial style and teaching strategy is comparable to other online guitar tutorial websites. But, it notably lacks the sophisticated software-based next-generation learning tools that higher-rated systems have. No matter the skill level, pay attention to the type of instruction given by each program. For example, some guitar lessons have a plethora of guitar training materials including DVDs, online tutorials, books, charts, and so on. If you find that certain guitar lessons are limited to one type of instruction, it may not be aligned with your personal learning style. Therefore, look for a guitar lesson program with instructional methods that work well with your particular learning needs and skill set. For example, a program that relies solely on CDs, DVDs, and books can be a good method of learning, but it is inherently limited by the fact that if updates are needed, an entirely new reprint and redistribution of media is necessary. Alternatively, if a program has online components, the updates can occur more immediately, frequently, and without additional replacement cost to the consumer. Additionally, online or software-based programs can offer more value with unique interfaces that can connect directly to electronic instruments and provide next-generation learning experiences that DVDs and books cannot. Skill Level. Is the target of the guitar lesson just for novices or is there something to offer for more advanced players? Instructional Methods. Is your personal learning style represented in the tutorials? Value. How does the lesson system stack up in terms of superior value for its price? 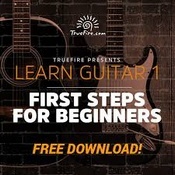 TopConsumerReviews.com has reviewed and ranked the best Guitar Lessons available today. We hope these reviews help you find the right guitar lessons to fit your needs right away! World Guitar Day returns for 2019!